The Olive Market @ The Olive Press provides a specialist retail outlet in Greytown for our shareholders and pressing clients. 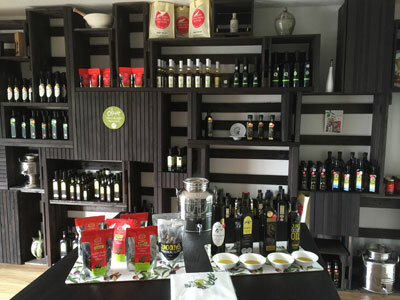 The shop stocks branded Wairarapa extra virgin olive oil, a range of infused oils from our local producers, table olives and tapenades, olive oil body products and some stainless steel storage containers. We will be adding to the product range regularly. WE APOLOGISE FOR ANY INCONVENIENCE BUT WE HAVE OUR 2018 HARVEST AND PROCESSING SEASON DURING WINTER. WE NEED TO CONCENTRATE ALL OUR RESOURCES ON THIS SO WE CAN BRING YOU MORE WONDERFUL NEW SEASON’S EXTRA VIRGIN OLIVE OILS IN THE SPRING. We will match buyers and sellers of fruit and/or oil anywhere in New Zealand. Using the existing storage facilities of The Olive Press in Greytown, Wairarapa we can hold oil for short or long periods of time if required. Do you have a grove/orchard you can’t manage? Trees full of fruit that you can’t or don’t want to harvest? The Olive Market will take care of this by taking a lease or management contract on your grove, either medium or long-term. We will then harvest and process your fruit for trading under our own brand. The Olive Market trades in bulk oil, in quantities of 20 litres or more. We will buy your fruit ‘at the Press door’ or your processed oil at any time. Prices paid are available on application or by negotiation. Please contact us.